St. Patrick’s Day Gift Pack at GoatMilkStuff.com includes Rosemary Mint soap in marbleized green, Rosemary Mint-scented solid skin lotion and Peppermint lip balm. At Goat Milk Stuff, our part-Irish family wanted to commemorate St. Patrick’s Day with a high quality gift pack. Goat Milk Stuff announced the introduction of a special St. Patrick’s Day Gift Pack to celebrate the annual March 17th occasion when people commemorate the spirit of Ireland with friends and family at festive meals, parades and gatherings across America and around the world. The limited-edition St. Patrick’s Day Gift Pack is a thoughtful gift that conveys the colors and scents of the Emerald Isle. Presented in an elegant green organza bag, the St. Patrick’s Gift Pack, at $18, includes one 5-ounce bar of luxurious Rosemary Mint goat milk soap in appealing marbleized green reminiscent of the lush colors of Ireland’s landscape, along with one Rosemary Mint-scented solid skin lotion and one Peppermint lip balm. St. Patrick’s Day Gift Pack orders received at http://www.GoatMilkStuff.com before Thursday, March 13th will be sent by Priority Mail to arrive by March 17th. Chicago’s CBS-TV WGN Midday News Emmy-award winning anchor Steve Sanders recently interviewed the family about how they make all Goat Milk Stuff products on its Indiana farm. The 8 Jonas children, ages 6 to 17, help in age appropriate ways from milking goats to assisting in the office and store. 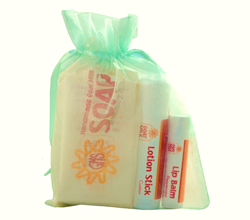 In addition to offering special gift packs, Goat Milk Stuff has a wide array of chemical-free natural goat milk soaps in a variety of colors and scents. Each bar of soap contains skin softening goat milk that moisturizes skin, as customers offer write to say it also helps clear up dry skin, eczema and psoriasis. The skincare qualities of Goat Milk Stuff were acclaimed in national media on The Doctors, CBS’s hit national daytime show, and by Oprah Magazine among others. Online at GoatMilkStuff.com, the Scottsburg, Indiana company makes and markets all-natural Goat Milk Stuff™ products including goat milk soaps, lip balms, lotions, bath bombs, laundry soap, soy candles and more. For media, licensing or entertainment, contact Brian Dobson at DobsonPR.com or BD(at)DobsonPR(dot)com. 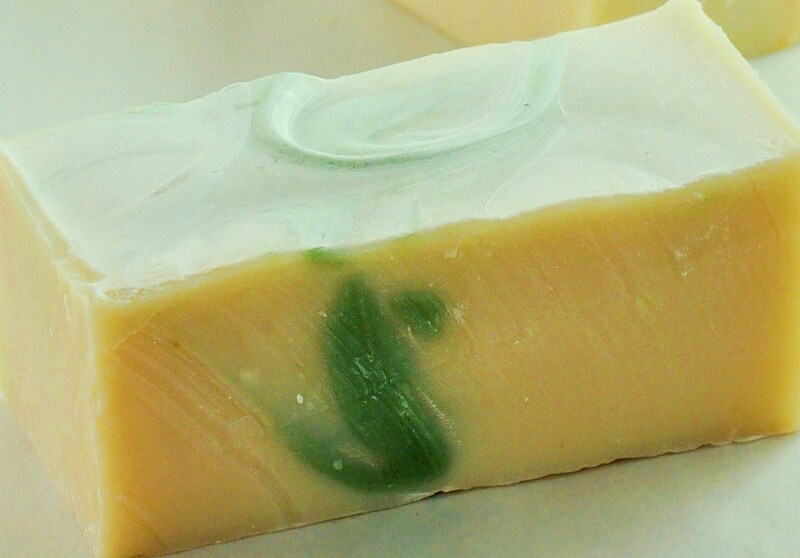 Goat Milk Stuff's Rosemary Mint goat milk soap in appealing marbleized green is reminiscent of the lush colors of Ireland’s landscape. 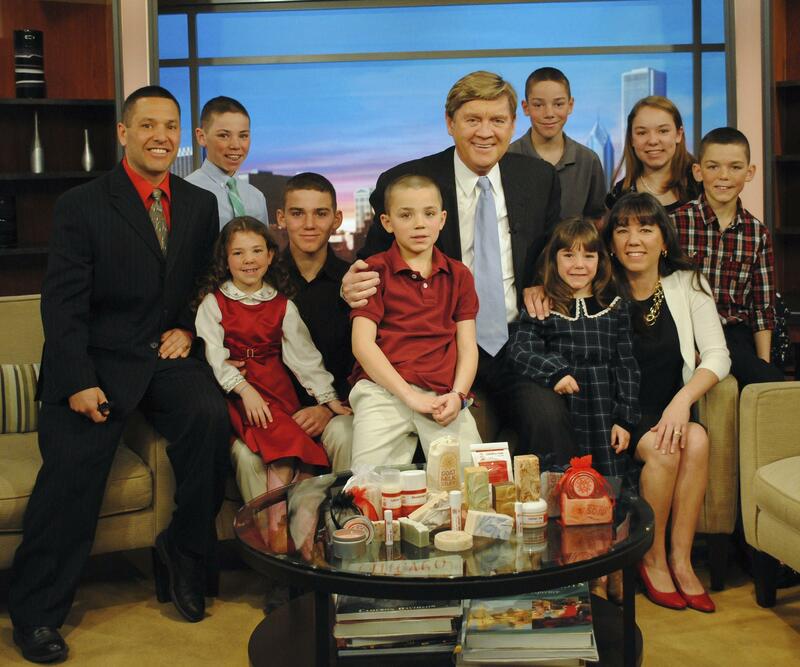 Chicago's CBS WGN-TV Midday News anchor Steve Sanders, center, interviewed PJ and Jim Jonas and their 8 children, ages 6 to 17. 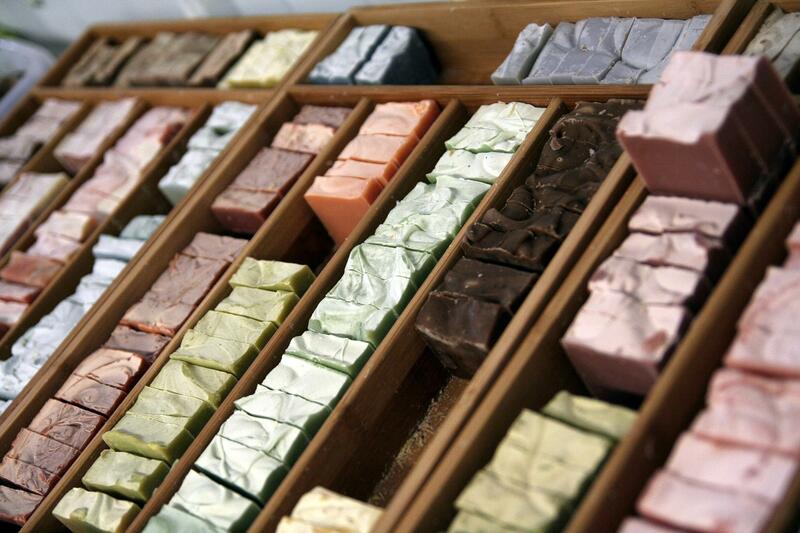 Goat Milk Stuff goat milk soaps are luxuriously creamy & leave skin clean and moisturized.